He first started recording in the early 1970s with Jefferson Airplane violinist Papa John Creach. Creach hired him when Moore was just twenty-one years old; Moore appeared on four of Creach's albums. He was further immersed in the blues with his long stint in the Whodunit Band, headed by Bobby "Blue" Bland producer Monk Higgins. Moore jammed with Albert Collins and Big Joe Turner. In 1996 he released Just Like You, which featured guest appearances from Jackson Browne and Bonnie Raitt. In 2004, he appeared on Amy Grant: Greatest Hits 1986-2004 in a duet entitled "Come Be with Me", which became a modest success on pop radio. In 2005 he appeared on Buddy Guy's version of "Ain't No Sunshine", along with Tracy Chapman. That same year, he appeared on Eric Clapton's album Back Home. In 2006, he co-wrote the song, "I Hope", with the Dixie Chicks for their album, Taking the Long Way. According to Songfacts, in 2010 I See Love was used as the opening theme tune for American sitcom Mike & Molly. 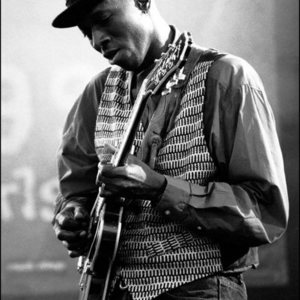 Keb' Mo' is one of the foremost contemporary blues artists. With an endearing sense of faith in humanity evident on most of his tracks and a very interestingly textured voice, this man has successfully merged traditional Delta blues and modern acoustic singer-songwritership. While it's a stretch to call him a traditionalist, Keb' Mo' plays a mean guitar, and the meticulously played guitar on each one of his songs is awe-inspiring. After spending his early career backing blues artists up, he released his debut album in 1994. He also appeared in Scorsese's film about the blues. As the only man to my knowlege that has incorporated the word "internet" into a blues song, it is clear that Keb' Mo' is unique and has, in an unprecedented manner, carved out his own genre that never fails to make the listener smile.